Are you unsure which color hair extensions will match you best? Which Hair Extension is your color? Hair Extension Store offers a variety of colors, we hope we have helped you pick the perfect color (s) for you! When purchasing clip in hair extensions it is important to know which color hair you want. If you want to match the extensions to your own natural hair it is best to take the color of the tips of your hair. If you purchase hair extensions that match the roots of your hair and not the tips it will be harder to blend in the hair extensions. The tips is what will be blended in so it is important that it matches your hair. If the color is slightly off it usually will not be too noticeable. Hair Extension Store uses the standard colors in their hair extensions meaning that hair color number 1 will be the same color number 1 any other place. Each screen monitor can be slightly different so it is important to be aware of that when picking a color based on our color chart. 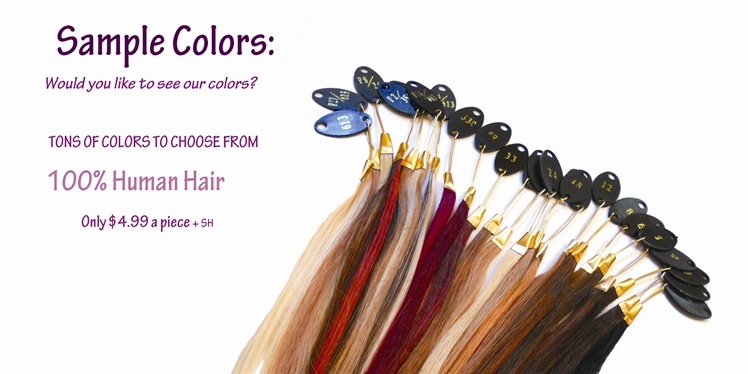 If you need help picking the right color you can email us at sales@hairextensionstore.biz. You can also send us a picture or an actual hair sample and we will assist you in picking a color. A simple way to blend in hair extensions is to add some waves or curls to your hair. (making sure that it is human hair or remy hair, not synthetic) When doing this the colors will blend together nicely and it is nearly impossible to see where your hair ends and your hair extensions begin. The pictures of the colors are very close to the reality of the hair, but computer monitors have different settings and so they may be altered. In reality, we offers perfection in color, and these little swatches can not fully represent how lovely these colors are. Between what is written as DESCRIPTION, what you can see in THE IMAGE, and what you can IMAGINE is the true color.